Since Larry Marsh founded Marsh Heating in 1974, we’ve worked hard to become the best heating & air conditioning contractor in the Twin Cities. Over the years, we’ve become the type of business that customers will keep coming back to for all of their HVAC needs. We still earn most of our business through repeat customers and word-of-mouth referrals. We understand that no catchy radio jingle is a substitute for an honest recommendation from a friend or relative. We hire the most skilled and experienced HVAC technicians in the Twin Cities area; when you work with Marsh, you can be confident that you’re getting the best service possible. Our commitment to customer satisfaction has helped us earn our status as a Dave Lennox Premier Dealer. Lennox doesn’t award this distinction to every HVAC contractor; to earn this title, each heating & air conditioning contractor must demonstrate exceptional product knowledge and expertise. In addition, Lennox surveys its customers to assess the professionalism and customer satisfaction of each of its contractors. Only those contractors who measure up to Lennox’s exacting standards are granted Premier Dealer status and access to Lennox’s top-tier Signature products. We are proud that Marsh Heating & Air Conditioning has remained a family owned and operated business since 1974. While Larry handles much of the estimating duties, Kelly Marsh leads our Residential Installation Department and Corey Marsh leads the Service Department. Although we originally started in Maple Grove, we soon outgrew our cozy space. In 1980, we relocated to a bigger space that would give us even better access to our customers, allowing us to service them faster. Since then, our company has operated out of our Brooklyn Park MN location. Our desire to fulfill our customer’s needs and wishes drives us to work hard every single day. 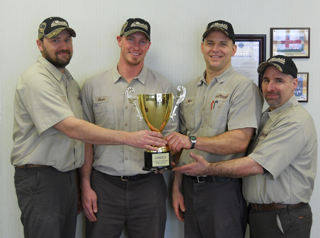 At Marsh, our entire team is dedicated to becoming the best provider of heating and air conditioning in Minneapolis MN. To better serve our community, we are a part of the “HEAT UP MINNESOTA” program, where we partner with Lennox to provide installation of a new heating system for a Minnesota family in need. We also offer a special maintenance program to help our customers save money on their heating and air conditioning in the Minneapolis metro area. With our program, your units will be kept in good working condition, helping them to last through even the toughest Minnesota weather. If you need urgent furnace repair or air conditioning repair services, our after hours emergency service will have a certified HVAC technician at your home or business within no time. From our location to the services we offer and the products we carry, Marsh Heating and Air Conditioning exists to serve you.